Kelly Macdonald Replacing Reese Witherspoon in Pixar's "Brave"
Not only is Pixar hopping on the girl power movement in Hollywood, they've gone and cast a nationality appropriate star in the lead. Kelly Macdonald, who has been earning raves beginning with her work in "Trainspotting" right up to her current role on "Boardwalk Empire," has replaced Reese Witherspoon as the voice of Princess Merida in "Brave," confirmed Entertainment Weekly, which also has the first concept art from the film. Set in the Scottish Highlands, "Brave" is a fairy tale about a princess who endangers the rule of her parents, the king and queen (Billy Connolly and Emma Thompson), and must go on a quest to set things right. We're guessing she'll be successful. "Brave" is due to hit theaters June 22, 2012. 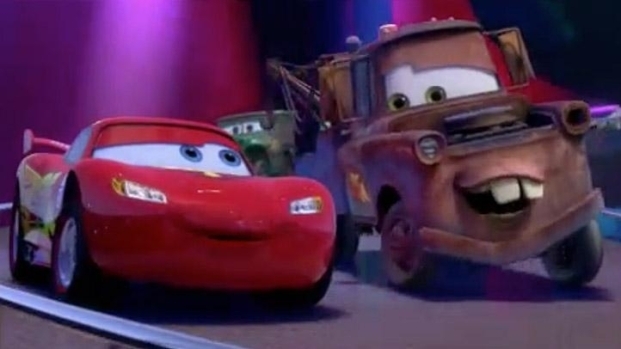 Pixar Unveils 17th--and Final?--Clip From "Cars 2"
Owen Wilson and Larry the Cable Guy are the voices of Lightning McQueen and Mater, who are joined in their latest mission, an international caper, by the likes of Michael Caine and Emily Mortimer. "Cars 2" opens June 24.